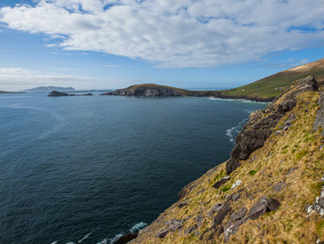 Dingle is a lively, port town situated on the West coast of Kerry. A Gaeltacht area it is a well-know haven for wonderful food, art, culture and craic. 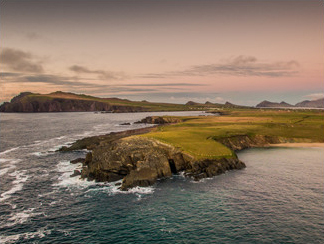 There’s something for everyone in Dingle from boutique shopping to fine dining, amazing surfing to endless beach walks. Dingle is the kind of town you’ll find something new in every time you visit, and you’ll always keep going back. And who could forget the most famous resident of Dingle? Fungi is still inhabiting the Atlantic waters around Dingle and will graciously put in an appearance for visitors whenever they call to see him. The route of the cycle takes in the Dingle Peninsula and Corca Dhuibhne. The Slieve Mish mountain range and Mount Brandon tower above the beaches and inlets of the coastline. 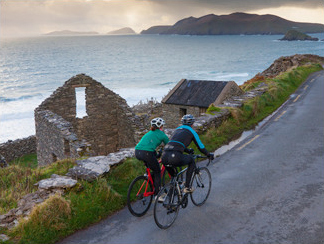 The Blasket Islands are situated in the west of the peninsula – all of which combine to offer a spectacular backdrop to Ireland’s newest and most exciting cycle sportif.